I was pretty hyped about Zero Mission, right from the start. Some of my fondest memories are from playing the original Metroid. I’m a “newer-is-better” kinda guy, so I was all for a remake of one of my favorite games of all time. The screenshots and movies came along, and the hype increased. Every new teaser looked better than the last. This game just couldn’t come out soon enough. 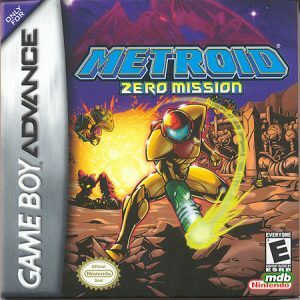 Then February 9th, 2004 hit, and there I was, playing Metroid Zero Mission. And it was awesome. It fully lived up to my expectations. This is a retelling of the original Metroid, what really happened during Samus Aran’s first invasion of the Space Pirate base on the planet Zebes. The game is bigger and the story is more detailed. It extends beyond the battle with the Mother Brain and adds a new element of gameplay to extend the enjoyment factor. We all know the background story from the original game’s instruction booklet, and that part hasn’t changed. What has changed is the actual mission itself. 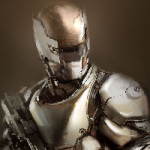 Cutscenes have been added to flesh out the details and introduce the antagonists, one at a time, as well as to set the mood for the next zone or battle. The scenes are short enough not to interfere with the pacing of the gameplay, and cover every necessary aspect. You won’t be walking away with any questions. The additions of the Chozo lore and glimpses of Samus’ past fit in well with what has been established in comics during the 90’s and hinted at in Metroid Prime. While I’m not a fan of the “raised-by-Chozo” storyline, it’s upheld in an interesting way in Zero Mission. You’re not beat over the head with it, but it is still ever-present. Samus Aran has never had tighter control. From blasting to wall jumping to bomb climbing, Metroid has never played so well. It doesn’t take many tries to do exactly what you want to do, even if that means horizontal bomb climbing, or carrying a speed charge through several rooms. In fact, it kind of makes the game too easy. Not that I’m complaining, mind you. I’d rather play a game that is too easy because of perfect control than one that is too difficult because of lousy control. The only big problem I have with the gameplay is the speed. It’s too fast. To cover the same amount of distance in the original Metroid would take nearly twice as long. Even Metroid Fusion didn’t play this fast. This really does make the game short. You’re covering nearly twice as much area as in the orignal, yet you can finish the entire thing in less time. If the developers has just extended the two-hour time limit for the best endings to four hours and slowed down the gameplay, then the game would have been that much better. The short length of the game hurts, especially because there is so much to see and do. It’s all over much too quickly. And multiple play-throughs don’t help much, because the game just begs to be played at full speed. If you try to take your time, you feel like a senior with a walker. I really wish they would have slowed the game down. It kind of feels arcade-like in its fast pacing. The speed can be exciting during boss battles, however. I would have preferred a slower, more tactical fight, but a fast and furious battle is still good fun. Ridley was a blast. Far too easy, but still fun nonetheless. I wasn’t too impressed with the stealth section, though. While it is great to play as an armorless Samus again and the control is very good, it is still very difficult to avoid taking hits from the Space Pirates once they’ve seen you. And several places require absolutely perfect timing to avoid being seen, something that requires more luck than skill. I think the problems are mostly attributed to the level layout. All of Chozodia was a pain to navigate, even with the fully-powered suit. Thankfully, it’s a short section of the game. Many people complained about the “hint” system in Metroid Fusion, preferring to find things on their own. Unfortunately for them, it’s back, only a little less intrusive this time. Many of the hint-giving Chozo statues can be avoided. It’s not a big deal for those of us who are experienced with the original game, though, as all of the items are still in the same spots as before. “Sequence breaking” is back in Zero Mission, only this time it’s intentional. Many hidden passages lie in wait for the intrepid explorer who likes to play the game their way. In response to the complaints of no sequence breaking in Metroid Fusion, the developers have gone out of their way to set up various sequences for us to take, making the game path very customizable. In fact, it’s so easy to sequence break now that most people will do it at least once on their first time through the game, not even realizing it. They will later come across a new Chozo statue that won’t give a hint because you’ve already gone out of your way to find that item on your own. New to North American Metroid fans are the difficulty settings. Normal is pretty easy, Hard is a good challenge, and Easy is for your dog, who could probably beat it with his eyes closed on that setting. Complete Normal mode to unlock Hard mode, and to access the original Metroid, which will then be accessible from the Options menu. Normal and Hard modes must both be played in several different ways to unlock all eight endings. As usual, these are affected by time and item percentage. Zero Mission comes out on top, with a dark, stylized atmosphere that looks fairly realistic. Original screenshots and videos had the game appearing in a somewhat super-deformed anime style, and fortunately that style has made way for the current graphics we have now. They look great, and fit the Metroid style perfectly. Samus looks tough and agile, and the enemies look more menacing than ever. The bosses take the cake, however, as they are all huge and very detailed. Everything is well animated, and every zone of the game has multiple texture sets. You won’t be seeing the same backgrounds for long, because nearly every set of rooms has something new. This is very refreshing, compared to the original. While we don’t get lost so easily in Zero Mission due to the distinction of each area, it makes up for it in the richness of what we’re seeing. There is so much difference, in fact, that it makes each area feel smaller, as you don’t get to see those textures for very long. Zero Mission is far above average in this regard; it would have looked fantastic with only half of the texture sets it has. There is nothing to complain about in this department. Out of the music and the sound effects, I’m not sure which one I liked more. They were both great. The music tracks are all redone versions of the same tunes in the first game and Super Metroid, plus new tunes for the new areas. They all fit together, as if the original game always had these extra zones. While the remixing wasn’t perfect, it was still very good. I can’t complain. The sound effects are right on. You will find modernized versions of all the old sounds, while still sounding as close to the originals as possible. They sound the way they always should have, without the 8- bit hardware limitations of the mid-1980’s. I think the only sounds I didn’t like were Kraid and Ridley’s voices. They don’t sound very menacing with such high-pitched screams. But that isn’t much different from Ridley in Metroid Fusion, so at least it’s consistent. Metroid Zero Mission is awesome. It has great graphics, sound and gameplay, and it takes us back to the good old days of Metroid. For those new(er) to the series, it gives them a modern way to experience its origin without the old-fashioned graphics and gameplay. What else is there to say? If you don’t already have Zero Mission, go get it! It might be the best Metroid game in your library.